Buddhism was introduced to China from India, the religion has seen many ups and downs. The temples across this city have borne witness to these changes. The smell of incense can easily lead visitors to the Lama Temple (Yonghegong), Guangji Temple, and Fayuan Temple, among others. Of these, the Lama Temple is the best known. It is here that Beijingers come to pray for good fortune. You can smell the rich thick scent of Tibetan incense, composed of sandalwood and sapan wood. The intoxicating smell emerging from the many incense shops inside the temple and at the street’s entrance, fills the air. The faithful believe that air is a spiritual, not material, substance and a medium for offering gifts to the gods. After offering worship, devotees stick the joss in large bronze burners, green with age and filled with incense ash. 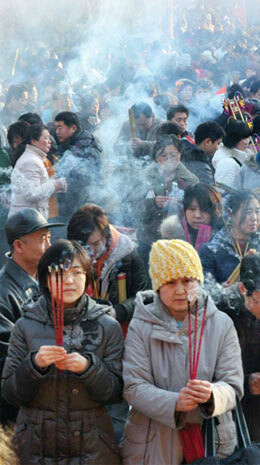 The smoke from these joss sticks and their sweet fragrance is the densest during the Spring Festival. It starts on the first day of the Lunar New Year. Carrying giant incense sticks, devotees begin queuing up from 6 in the morning even though the temple gates open only after 8:30 am, so they can be among the first to light the oil lamp at the foot of the sacred Buddha. The frigid winter air does nothing to stop the smell of incense from the centuries-old lamasery from radiating to the whole city. It is reported that nearly 10,000 people visited the temple in just an hour on the first day of 2009. The second peak at the temple comes with the Laba Festival that falls on the eighth day of the 12th lunar month (mid-January to mid-February) – the day Sakyamuni, founder of Buddhism, achieved immortality. Each year, crowds of people head to the fogbound temple on that day for a bowl of Laba porridge made with nuts and dry fruits. Burning a stick of incense, some seek blessings for a baby, some for a good marriage, and others for a promising future. It is important to come back to redeem a vow, if the wish comes true. Five months ago, the city saw another boom in incense burning, as the temple flooded with hundreds of high school students from all over the nation praying for admission to the college of their choice. Countless joss sticks were burnt, with carts shuttling in and out every few minutes, wheeling piles of incense ash from the giant burners. Outside, in the main courtyard, tourists attempt to throw coins into a tall bronze vessel covered with elaborate markings. The belief is that if the coins land inside the vessel, it signals good fortune. This entry was posted in Chinese Culture and tagged Beijing, Lama Temple, Tibet. Bookmark the permalink.